“How can most people submit so unthinkingly to the dehumanizing experience of lifeless fast food that’s everywhere in our lives? How can you marvel at the world and then feed yourself in a completely un-marvelous way? I think it’s because we don’t learn the vital relationship of food to agriculture and to culture, and how food affects the quality of our everyday lives.” —Alice Waters Alice Waters coined the term “delicious revolution”, which inspired a groundswell of support for a conceived ecological practice of sustainable and locally-sourced foods. 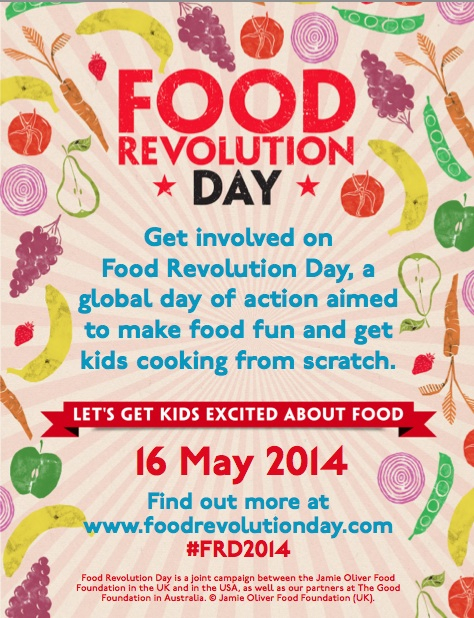 One of the many organizations championing this cause is Food Revolution, a global campaign organized by the Jamie Oliver Food Foundation in the UK and USA, and The Good Foundation in Australia. To date, 74 countries have taken part and over 900 ambassadors are championing the cause worldwide. On Friday May 16 through Sunday May 18, Food Revolution SF is partnering with the Italian Cultural Institute, Le Forchette Tricolore, and Tomato Sherpa to celebrate the Third Annual Food Revolution Day with cooking demos, a social mixer for tech savvy foodies, and an elegant Italian feast. On Friday May 16, “Food Apps for a Better Lifestyle” at the Italian Cultural Institute will kick off Food Revolution Day featuring demonstrations of food apps and snacks prepared in keeping with FRD’s ethos of supporting organic, sustainable and locally sourced foods. Participating at the event will be HarvestMark, a fresh food traceability platform, Label GMOs, a campaign to label genetically engineered foods, SupperShare, a startup that connects home cooks with local food enthusiasts, Hampton Creek, a food startup and manufacturer of Just Mayo, and Whole Foods Market. Interested parties can register here. On Saturday May 17, the Italian cooking club Le Forchette Tricolore will delight participants with a multi-course dinner featuring regional Italian specialties. Last year Le Forchette’s Tavola raised over $2000 for the Jamie Oliver Food Foundation. This year a portion of the proceeds will go to benefit 18 Reason’s Cooking Matters project, a national initiative offering food education and cooking classes to low-income families. Interested parties can register here. This entry was posted in Eat and tagged Eat, Food Revolution Day, special event. Bookmark the permalink.